The Florida Gators walk into the stadium greeting the Florida fans before the start of the season opener versus the Idaho Vandals. 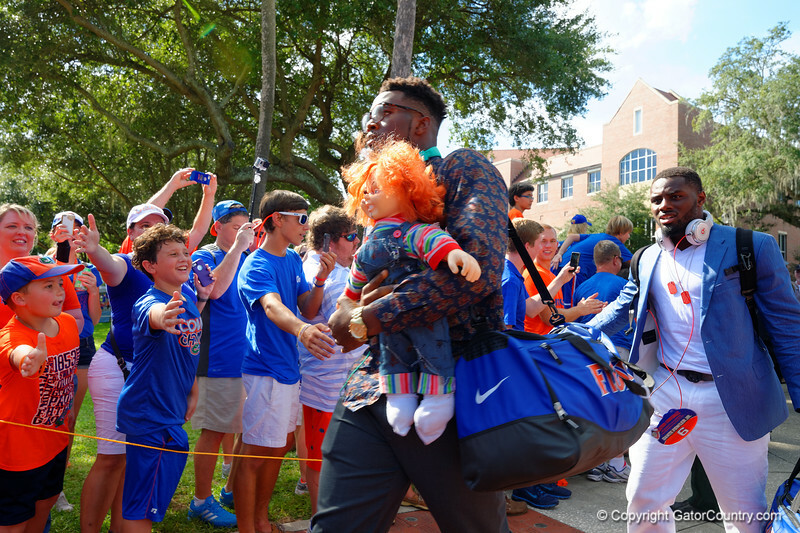 The Florida Gators start of the 2014 football season with the Florida Gators Gator Walk. Florida Gators defensive lineman Dante Fowler, Jr. and the Florida Gators march into Ben Hill Griffin Stadium greeting the Florida fans before the start of the game versus the Idaho Vandals. Florida Gators vs Idaho Vandals. August 30th, 2014. Gator Country photo by David Bowie. FloridaGatorsFootballGatorWalkIdado20140042014 Florida GatorsGator FootballFlorida GatorsSEC Football2014 Florida Fan DayFan DayStephen C O'Connell CenterUniversity of FloridaGator CountryBen Hill Griffin StadiumGainesvilleCollege FootballNCAA FootballGator WalkFlorida Gators defensive lineman Dante FowlerJr.